Safety Score: 2,6 of 5.0 based on data from 9 authorites. Meaning we advice caution when travelling to El Salvador. El Salvador with its capital San Salvador is located in North America (Central America, bordering the North Pacific Ocean). It covers some 21,042 square kilometers (about the same size as New Jersey) with 6,172,010 citizens. Spanish is the language commonly spoken used by the people in El Salvador. Interesting info is sharing borders with Guatemala and Honduras. 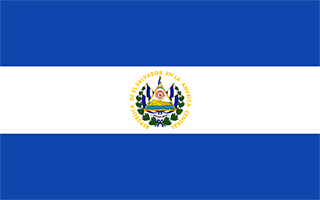 El Salvador is a country in Central America and, geographically, is part of continental North America. El Salvador is gaining a reputation for having some of the best surfing in the world. Tourists from all over Central America are discovering the surfing meccas of La Libertad (near San Salvador), El Sunzal, El Zonte and El Cuco (near San Miguel ), transforming El Salvador into the fastest growing surf tourism hot-spot in Central America. The countryside of El Salvador is breathtaking, with volcanoes and mountains offering green adventurers exactly what they are looking for. Many of environmentally-oriented community-based organizations promote eco-tourism, and there are a number of beautiful and secluded beaches and forests scattered throughout the country. The landscape is mostly mountains with narrow coastal belt and central plateau. The average density of population is about 293 per km². The climate in El Salvador can be described as tropicalrainy season (May to October), dry season (November to April), tropical on coast, temperate in uplands. Potential threats by nature are extremely susceptible to hurricanes, frequent and sometimes destructive earthquakes and volcanic activity, known as the Land of Volcanoes and significant volcanic activity; San Salvador (1,893 m), which last erupted in 1917, has the potential to cause major harm to the country's capital, which lies just below the volcano's slopes; San Miguel (2,130 m), which last erupted in 2002, is one of the . To reach someone El Salvador dial +503 prior to a number. The local cellular networks are operated on 850 MHz, 900 MHz, 1900 MHz, 3G, 4G. Websites typically end with the top level domain ".sv". If you want to bring electric appliances (e.g. battery chaarger), keep in min the local 120 V - 60 Hz (plugs: A, B). The sign for the locally used currency Dollar is USD. Three equal horizontal bands of cobalt blue (top), white, and cobalt blue with the national coat of arms centered in the white band; the coat of arms features a round emblem encircled by the words REPUBLICA DE EL SALVADOR EN LA AMERICA CENTRAL; the banner is based on the former blue-white-blue flag of the Federal Republic of Central America; the blue bands symbolize the Pacific Ocean and the Caribbean Sea, while the white band represents the land between the two bodies of water, as well as peace and prosperity.